Ready for the latest in the prepaid card market? Just when we think this particular aspect of credit cards has gone as far as it can, something new is delivered for consumers that completely changes the game and this PayPower card is the perfect example of a game changer. It offers many more opportunities to earn cash back (via credits on your account) and it’s already garnering a lot of attention in the financial sector. We reviewed this prepaid product recently and here’s what we discovered. There are so many features associated with this card. A few of them include $0 activation fee when you sign up online and for a limited time, if you make two direct deposits that total $100 or more each within 75 days of signing up, you’ll see a $20 credit added to your account within fifteen days after your second deposit is made. Plus, earn $30 if you opt to have your government benefits added via direct deposit onto your PayPower card. Enjoy another $20 credit when you refer a friend, too. The PayPower is being touted as the “perfect alternative to credit cards and checking accounts“. And with so many Americans who no longer have access to traditional bank accounts, it’s a choice that many are turning to. This, coupled with the lower fees these financial products now offer, it’s a fine choice for those looking for a solution to paying bills, shopping online and being able to rent cars and hotels. There is no credit check, so simply show your valid ID and you can be up and running in no time. It’s a prepaid card, so you don’t have to worry about NSF fees associated with a mistake in your check book. The Visa logo makes it acceptable anywhere Visa is and there are never APR fees to consider, either. Keep in mind, though, that valid ID means you must have a social security number. The PayPower card can be used for all of your purchases, it’s safer than carrying cash and you can even incorporate direct deposit for payroll checks or government benefits. Pull cash from thousands of ATMs around the world. Just like traditional Visa credit cards, your account is protected from unauthorized use by the Visa Zero Liability policy if your card is lost or stolen. The funds on the card are FDIC insured. Note, though, the Visa Zero Liability policy is applicable for U.S. issued cards only. The protection doesn’t extend to ATM or PIN transactions that aren’t processed by Visa. You can also use your PayPower Visa to pay bills on line or over the fund. This is great for those forgotten bills that are now two days away from being late. With a growing trend towards using costly wiring services, this eliminates that expensive option in its entirety. You can set up auto pay, too, through the website. Load your funds using REloadit Packs. These convenient options enable you to reload any PayPower card account with zero frustration and instant access as soon as the funds are applied. You can purchase and load a Reloadit Pack at any of the thousands of participating retailers and then transfer those funds to your card. There is a reload fee that will be added to your purchase, but it’s a convenient alternative to what other similar card options provide consumers. You can visit the REloadit site or there are several 800 phone numbers that allow you to easily add funds. There’s a ten digit number that’s found under a scratch off block on the back of the card. Simply provide that number, notate how much you’re reloading and you’re on your way. There’s even a great holiday promotion, too. It’s a great way to save on holiday shopping or those many holiday parties that require hostess gifts. Here’s how it works: now through December 24th, when you spend $500 or more, you’ll earn 1% cash back of the total of all your purchases. This cash back shows up as a credit on your PayPower card. Once you’ve received and activated your card, simply begin using it for all of your purchases. Once you hit the $500 threshold, you’ll see the credit applied back to your card on Christmas day. 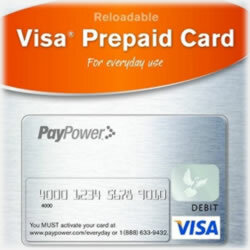 PayPower Visa Prepaid is the traditional prepaid card that offers all of the features we’ve outlined. Direct deposit is free and is applicable for your paycheck, tax rebate and government benefits. Reminder alerts are free and you can have them emailed or texted to your mobile. Of course, bill pay is free as well. The Visa Zero Liability policy applies, though you’ll want to review the terms and conditions so that you understand what’s covered and what’s not covered under the Visa logo. As you can see, this isn’t just another prepaid debit card that’s hit the market. This was a carefully designed product that had the consumer in mind with a focus on better benefits and more perks. It’s raised the standard and consumers are already flocking to it, fully aware of the many built in features it offers. Do you already have the PayPower Visa card? Want to share your thoughts with us? We’d love to hear your experience with this financial product. Have you been able to easily find ATMs? Are the fee structures, in your opinion, fair? Let us and our readers know your opinion.